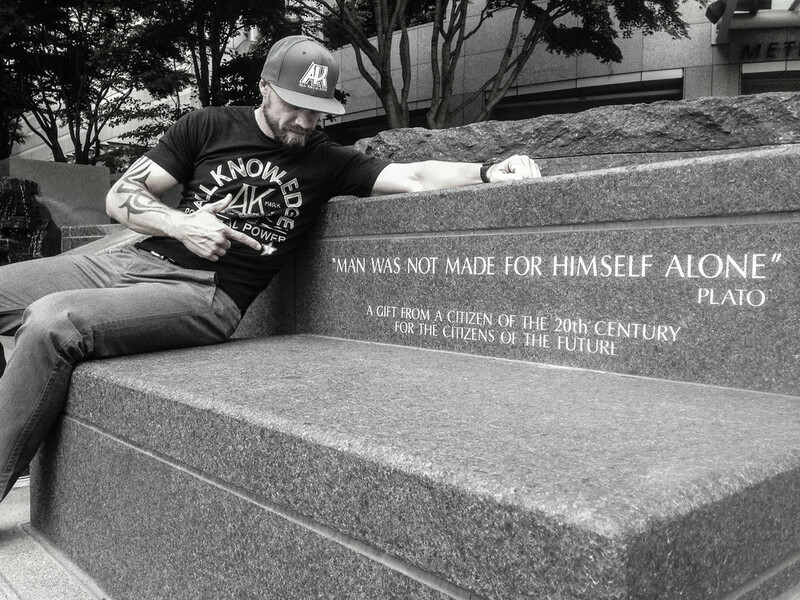 All Knowledge (AKC) is a lifestyle brand based originally in Seattle, Washington. The AKC brand is truly a collaboration of like minded individuals. The birth of an idea to meld all who seek knowledge to grow strong in their passion, creating a modern and strong family. A mixed bag of sub cultures from bjj, mma, surfing, yoga, rock climbing, boxing, skating, anything and everything that lets you feel alive. Recognizing and inspiring the community who risks and sacrifices for what they love, growing in body and mind. As a designer, my career was not really a career, wasn't much of anything. I was working part time and making digital signage for club events and sports at the college I was in. I despised it, it was a start. After I graduated, I didn’t want to work for anyone, I really wanted to try some serious creativity and see where I would end up as my techniques developed, I took a typography course at the School of Visual Concepts in Seattle, my mind was blown, I realized all that I did not know. It was wild and a bit scary. Eventually everyone comes to the realization that at some point in your life you are in charge of your own education. Sketching with out any true dedication or purpose, I decided to have one, to keep it simple. I made choice to start now, there was no right time, or waiting to “get my ducks in a row” there are no ducks there is just starting and then taking things as they present themselves, so that's what I did, just start. It was slow and the learning curve was and still is high, but I am having a lot of fun doing it. A student for life. As a brand the foundation is build on this, to “Seek Knowledge & Grow Strong” this motto or mantra, whatever you decide to label it, is not just a cool tag line, it’s a lifestyle. It’s a way to live, to love, to risk, to take the big bold leaps and keep your head up when things crumble in your palm. The growth of the AK brand is still in its infancy, we are crawling, and you know what, crawling is great because it is progress, and slow progress is still just that.